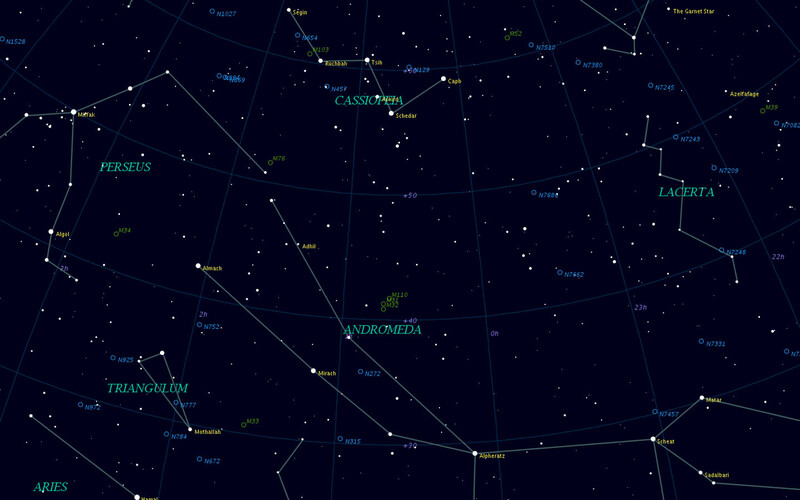 Andromeda's upper culmination occurs on the 23rd of September. This means that if the observer is facing south and looking high overhead at this time of year, the constellation will appear right-side up. However, as Andromeda is nearly circumpolar, it can be observed at a number of other times of year as well, with the observer facing north. For the present we'll describe the constellation as seen facing north, from the Spring through Summer. A very good prerequisite study would be Cassiopeia. Alpha Andromedae is better known as Alpheratz (or Sirrah) and forms the head of Andromeda. Many of the other bright stars represent her flowing hair. This star was once part of Pegasus and is still sometimes known as delta (d) Pegasi, as it forms the northeast corner of the Great Square of Pegasus. It is easiest to find Alpheratz with the naked eye. Beginning at the North Pole draw a line from the Pole Star to Caph (beta Cassiopeia). Now extend this straight line the same distance and you will come to Alpheratz. Depending on the time of year, you will see it in various orientations. You will have noticed how Alpheratz is one of four stars which make a circular line around Cassiopeia, four equally-bright stars roughly at the same distance from each other. (This quartet is particularly evident just as the brighter stars are beginning to make their appearance, early in the evening.) Clockwise, starting from Alpheratz, we have beta Andromedae, gamma Andromedae, and alpha Persei (Mirfak). Remember this quartet: Alpheratz, Mirach, Almach, and Mirfak. (Easy to do: just think of �al, mir, al, mir� and fill in the rest.) The first three are the brightest stars in Andromeda, the last one is the brightest star in Perseus (Mirfak also goes by the name of Algenib). Now look at Alpheratz. (Note that you'll have to turn to point toward the North Pole. For example, in the summer Andromeda is turned such that North is toward the west as the observer faces north, so the other stars -- that form the �wedge� in Pegasus--are to the east of the observer.) From Alpheratz move over to beta Andromedae. Either find the star with the naked eye or sweep your binoculars clockwise two FOV, through delta until you reach beta. Its red colour makes it fairly easy to find. Now click on that star on the graphic to find out how to find M31. Beta Andromedae, Mirach, is a red giant 200 light years away. The colour is easily noticed with the naked eye, making Mirach relatively easy to locate, as per the instructions above. Facing north, place Mirach toward the lower left of your glasses. You will find mu Andromedae near the upper edge of your glasses, toward the north. Now slowly sweep your glasses toward the North Pole until mu is at the opposite edge. Nu and 32 will be nearly centred. M31 is between nu And and the northwestern edge of your glasses. Gamma Andromedae, Almach, is one of the finest binary systems in the heavens, best seen in small telescopes or even binoculars: a triple system in which its brightest components (visual magnitudes 2.3 and 5.5) form a lovely colour contrast of yellow and blue. The blue companion also has its own orbiting companion, which orbits the blue primary every 61.1 years. This companion is also blue (visual magnitude 6.3). You will need a rather larger telescope to resolve these two, which are only about 0.4" apart. And as seen from the earth the component is gradually approaching the primary. Gamma Andromedae is easiest found with the naked eye as the third of the four stars which wrap themselves around Cassiopeia. The binocular view includes a fine star cluster south of gamma, NGC 752. In the same FOV is upsilon Andromedae which has recently been in the news as being the first discovered �solar system� with three planets. The planets orbit at distances of 0.05 AU, 0.83 AU and 2.5 AU. The middle planet with an orbiting distance of .83 AU is similar to the earth's. This middle planet orbits at about 230 or more days and has a mass of about twice that of As for the �sun� of this system --upsilon Andromedae-- it's about the same size as our Sun and is 44 light years away.